When summertime arrives, as it did in gorgeous fashion this weekend, a lot of my cooking shifts outside to the grill. 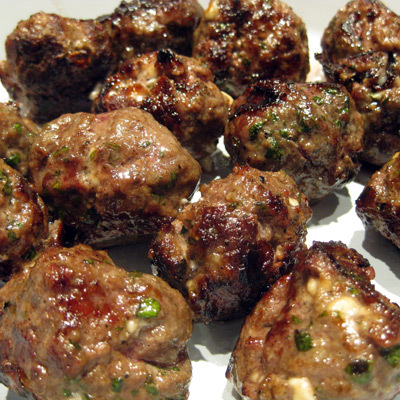 If you are the same, and looking for ideas, here are two different flavor profiles you might find interesting: grilled lamb and feta meatballs with a yogurt mint sauce, and a ginger, mustard seed and soy sauce marinated london broil (aka flank steak). I never liked natural yogurt until my wife Lisl took me to Greece one summer, and all of a sudden my definition of yogurt changed completely. 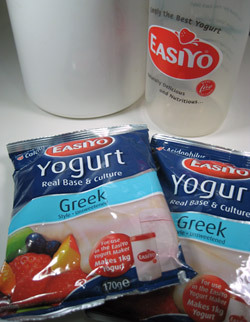 At that point I understood why all the Aussies and Europeans complained vociferously about American yogurt. P.S. we have no business connection to this brand whatsoever — we just love the product.